As I’m sure I’ve made clear here, I LOVE cupcakes. I also love peaches—it’s always sad that my two favorite fruits (peaches and pears) are two of the hardest to find perfectly ripe and sweet. 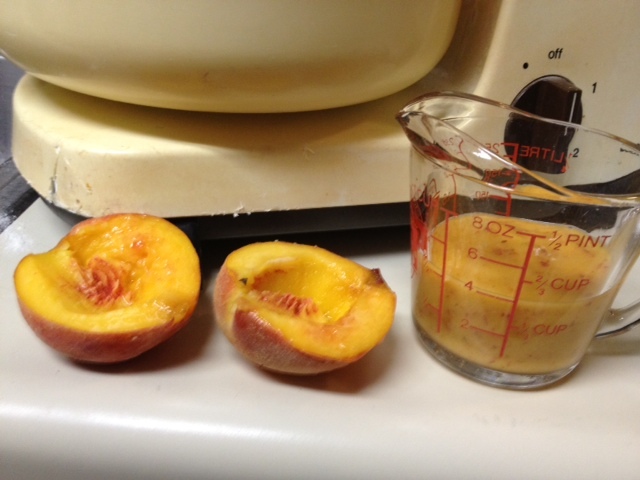 So, so many mealy, dry, gross peaches over the years. 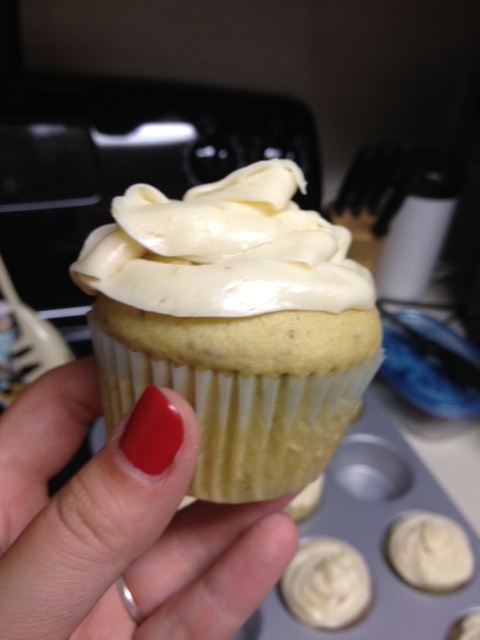 I pinned this recipe for peach cupcakes on Pinterest when I first joined a few months back, because it sounded so delicious. 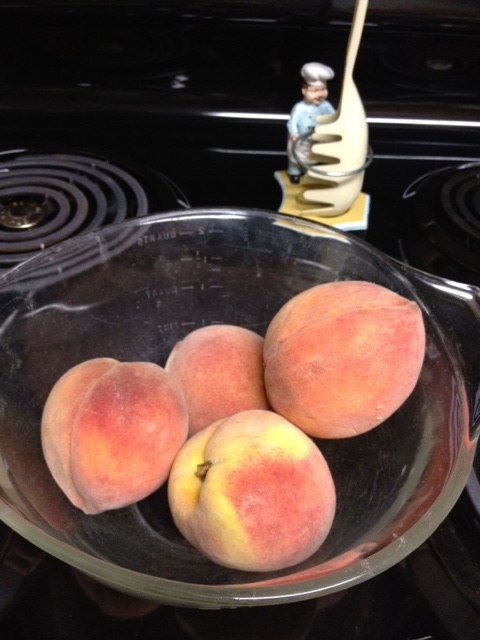 So when I snagged four awesome peaches from a farm stand, I knew exactly what I was going to do with them. I’ll admit I was a little torn on whether they were a success or not. 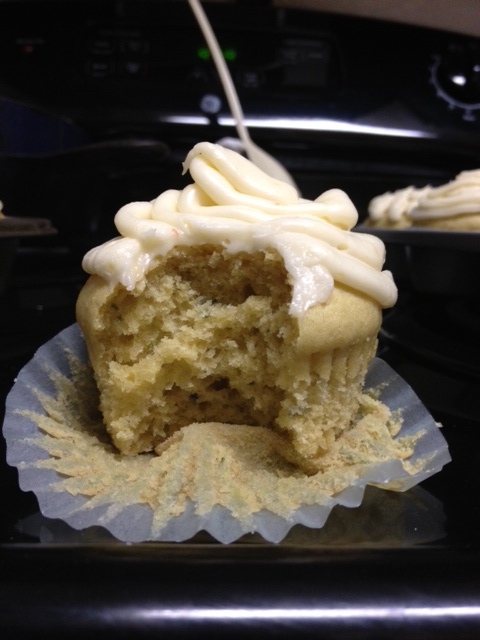 The cupcakes themselves had an amazing texture, probably the best I’ve had—moist, soft, fluffy, melt-in-your-mouth. The frosting turned out well, maybe not *quite* as good as last time (I felt it was maybe a tiny bit oily, like the butter didn’t blend quite as well as it could’ve). 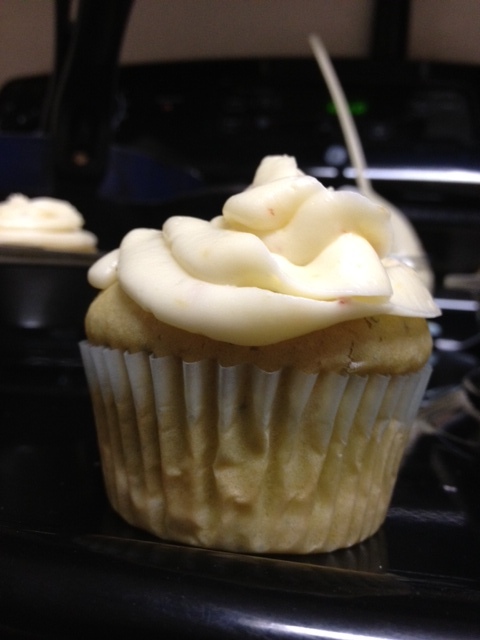 But mostly it was was the fact that the peach flavor was barely detectable in both the cupcakes and frosting. And with how much I love peaches, that was a bummer. So we’ll get into it, and I’ll offer up my thoughts. Biggest thing is I would try and find a way to add more peach flavor to everything. Maybe peach extract (which is quite hard to find), or even something like peach schnapps (maybe even a fuzzy navel wine cooler in a pinch!). Otherwise they were perfect. The recipe calls for regular flour, which is fine. 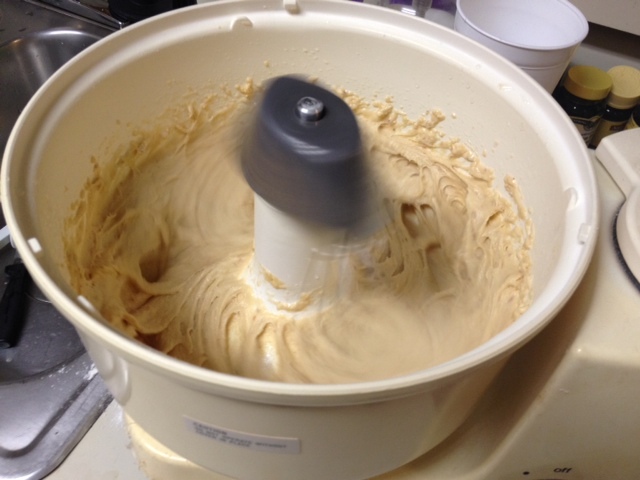 I’ve become obsessed with cake flour though, because it makes everything so fluffy and awesome. It’s super expensive, so you can make your own really easily—just flour and cornstarch sifted together. The instructions and proportions are here, if you want to use it. 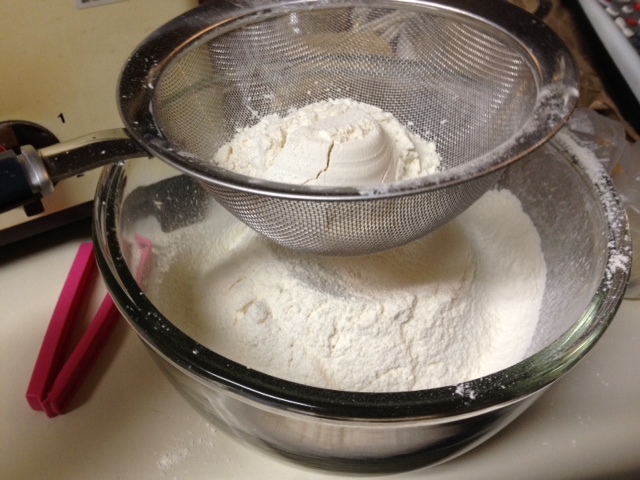 Add the other dry ingredients (baking powder, baking soda, sugar) to the flour, and sift or mix together well. 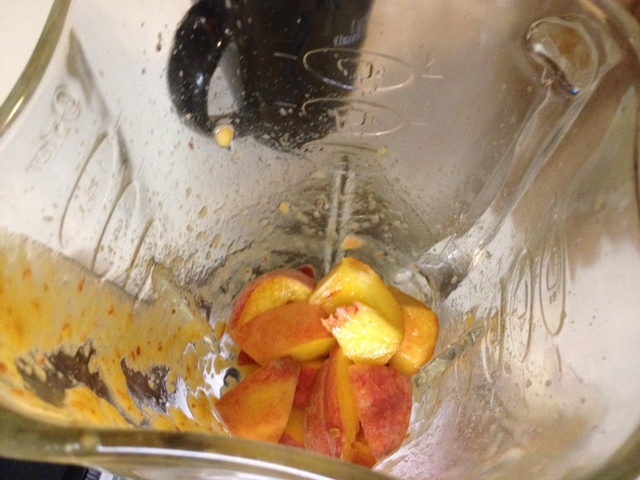 Puree the peaches in a blender or food processor (after taking out the pits). The recipe says to strain the mixture before adding to the batter, but I didn’t—figure the pulp and skin can add a little extra fiber. Also I’m lazy. Measure out a cup’s worth, but you’ll still need more for the frosting. Add the peach puree to the batter and mix well. 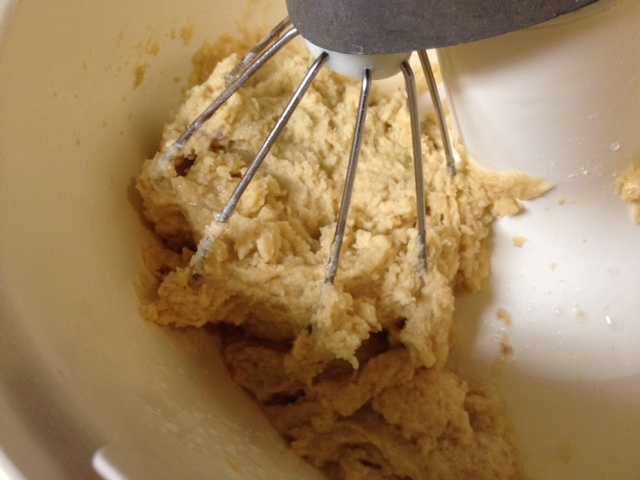 Add the other wet ingredients (just NOT the vinegar) to the batter and let it mix for a minute or two. Add the vinegar and blend very quickly. The batter should foam a tiny bit as the vinegar reacts with the baking soda. 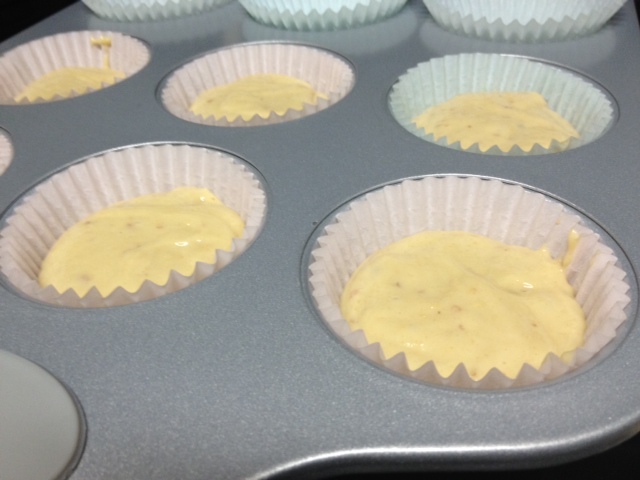 Pour or spoon the batter into the paper cups (or pour into a cake pan). The muffin cups should be about 2/3 full. Put in the oven for 20-25 minutes. 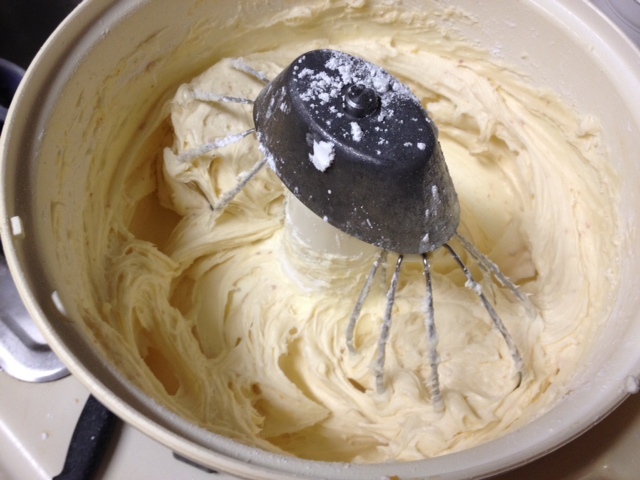 For the frosting, cream the butter and cream cheese together. Add in the powdered sugar a cup at a time, beating until fluffy. 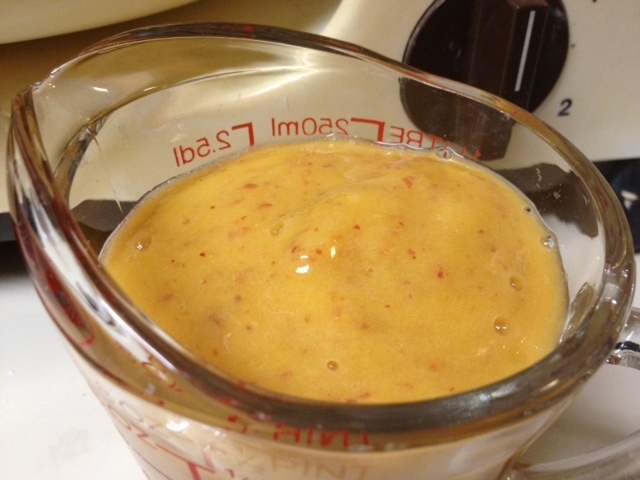 Add in the peach puree (and any other peach flavorings you have), and beat for a few minutes. It should be quite fluffy. Couldn’t hurt to put in the fridge for a bit to solidify it. I made it during 90-100 degree heat and my tiny apartment heats up pretty badly, so between that and me using a pastry bag (with my hot little hands), the frosting wasn’t as solid as it could have been. The cupcakes came out perfect and fluffy. 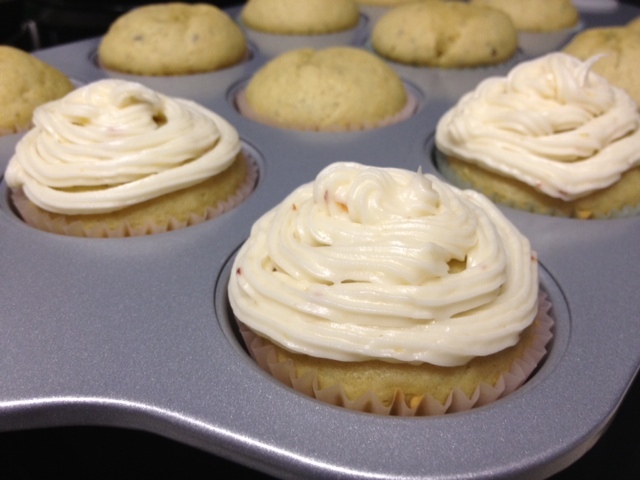 Once the cupcakes have cooled, frost as desired. I played around with the tips of my pastry bag. Still looks like a second-grader frosted them! 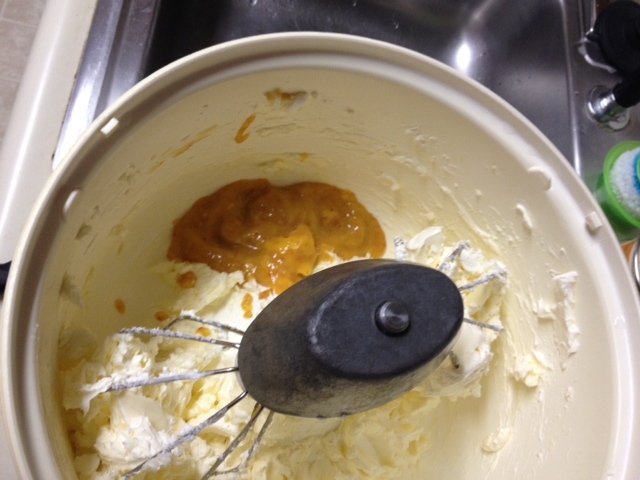 If you can get your hands on some peach extract (which is hard to find), I’d recommend for both the batter & frosting. Or you could try a tablespoon or two of peach schnapps. Preheat oven to 375°F. 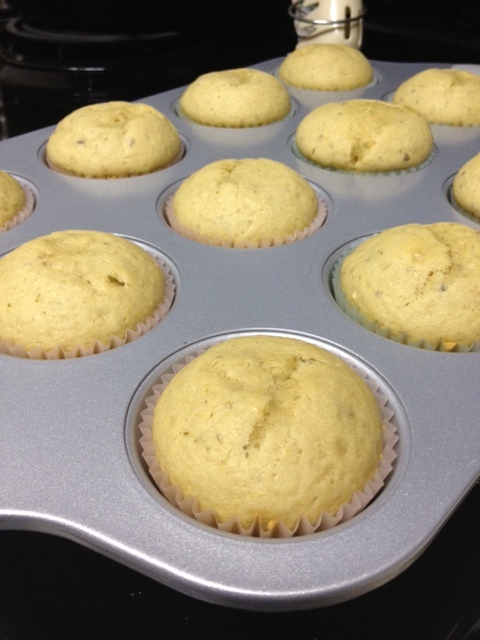 If making cupcakes, place the paper liners in a muffin tin; if making a cake, lightly grease and flour a 9-inch round or 8-inch square cake pan. 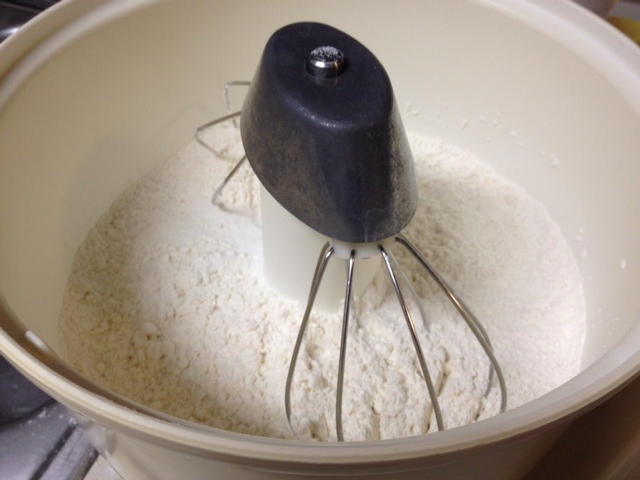 If making cake flour, sift the flour & cornstarch together, then sift together the flour, baking powder, baking soda, and sugar into a bowl. 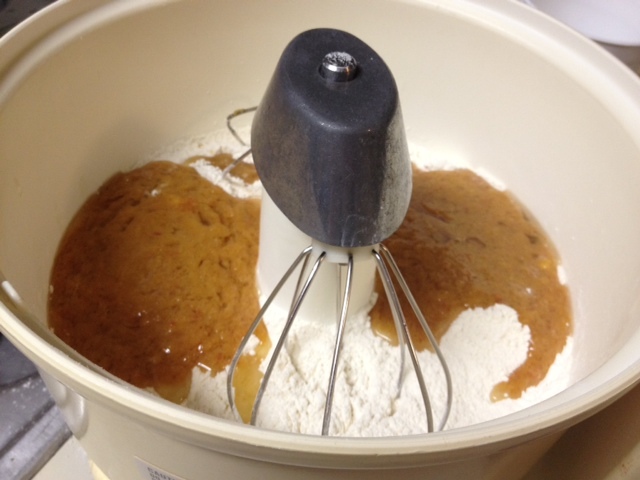 Add the peach puree, oil and vanilla, then add the peach mixture to the dry ingredients and whisk together until combined. At this point, you may want to add some yellow and food colouring to achieve a peachier color (I skipped the food coloring). 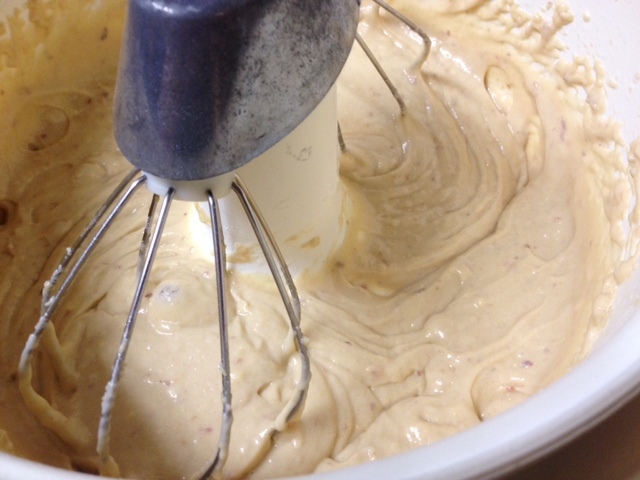 When the batter is smooth, add the vinegar and stir quickly. The batter will foam slightly where the baking soda and vinegar are reacting. 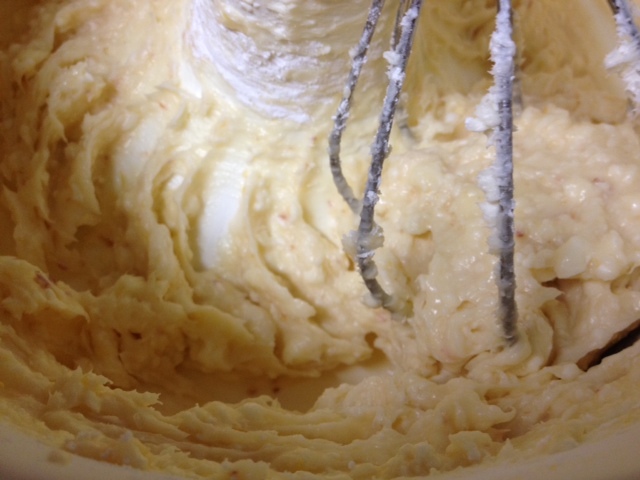 Stir just until the vinegar is evenly distributed throughout the batter. Pour the batter into the prepared pan or cups, and bake for 20 minutes if making cupcakes, or 25 to 30 minutes it making cake. Allow to cool before frosting. 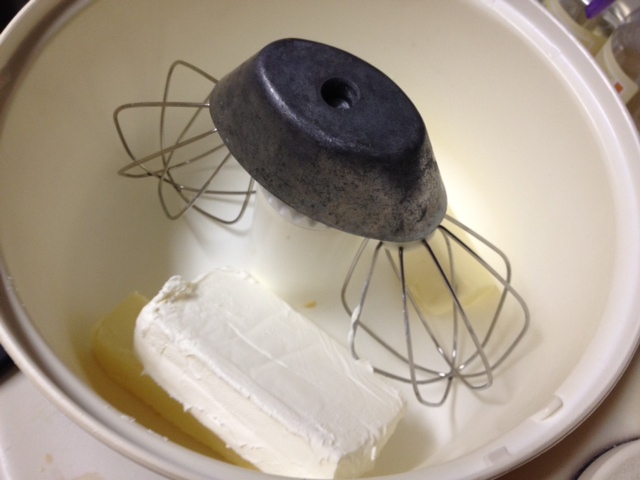 Whip the butter and cream cheese until light and fluffy. Add the sugar and beat until well combined. Add peach puree and vanilla and beat again until smooth. You may want to add some yellow and red food coloring to achieve a peachier colour. The original recipe is here, but I used my own frosting recipe. I didn’t add food coloring, since it kind of weirds me out.